Note: Click here for the Docker Monitoring webinar video recording and slides. 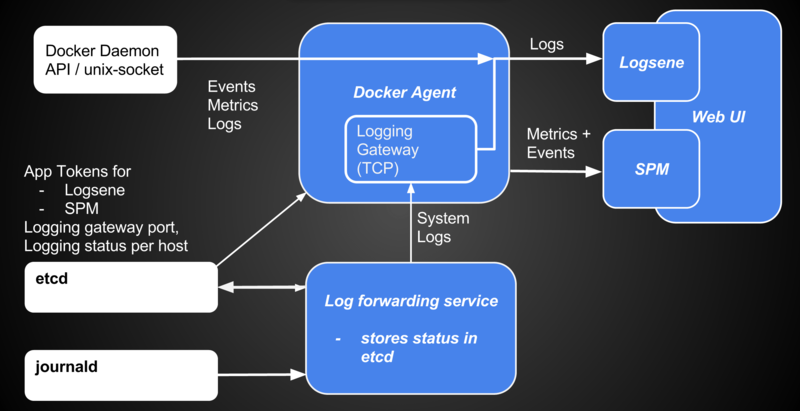 And click here for the Docker Logging webinar video recording and slides. SPM Agent for Docker was renamed “sematext/sematext-agent-docker” on Docker Hub (see Sematext joins Docker ETP program for Logging). The latest CoreOS service files and instructions are available in the new Github Repository. 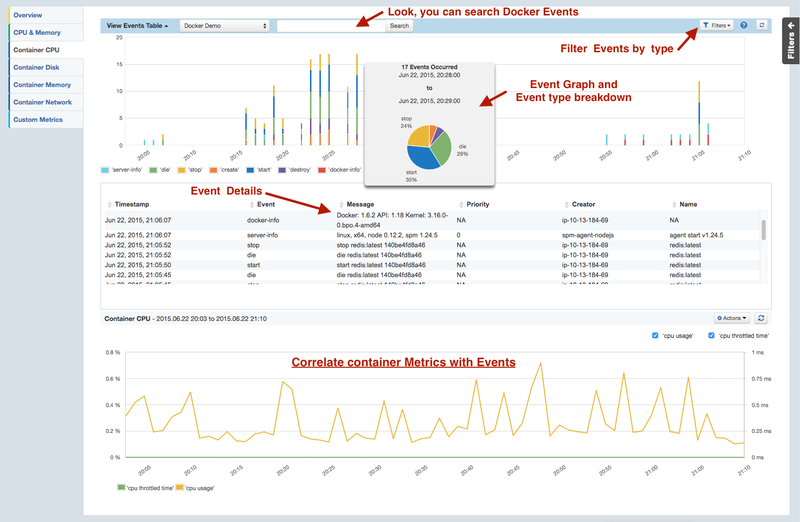 Docker Events like start/stop/destroy are related to deployments, maintenance or sometimes to errors and unwanted restarts; correlation of metrics, events and logs is the natural way to discover problems using SPM. There is often a mix of configurations in environment variables, static settings in cloud configuration files, and combinations of confd and etcd. We decided to have all settings stored in etcd, so the settings are done only once and are easy to access. In cases where the parsing fails, the gateway adds a timestamp and keeps the message 1:1. The transmission to Logsene receivers is encrypted via HTTPS. The log forwarding service streams logs to the logging gateway by pulling them from journald. In addition, it saves the ‘last log time’ to recover after a service restart. Most people take this for granted; but not all logging services have such a recovery function. There are many tools which just capture the current log stream. Often people realize this only when they miss logs one day because of a reboot, network outage, software update, etc. But these are exactly the types of situations where you would like to know what is going on! SPM agent services are installed via fleet (a distributed init system) in the whole cluster. Lets see those unit files before we fire them up into the Cloud. The first unit file sematext-agent.service starts SPM Agent for Docker. It takes the SPM and Logsene app tokens and port for the logging gateway etcd. It starts on every CoreOS host (global unit). The second unit file logsene-service.service forwards logs from journald to that logging gateway running as part of sematext-agent-docker. All fields stored in the journal (down to source-code level and line numbers provided by GO modules) are then available in Logsene. # please note the same key is used in the unit file! Send a few log lines to see them in Logsene. 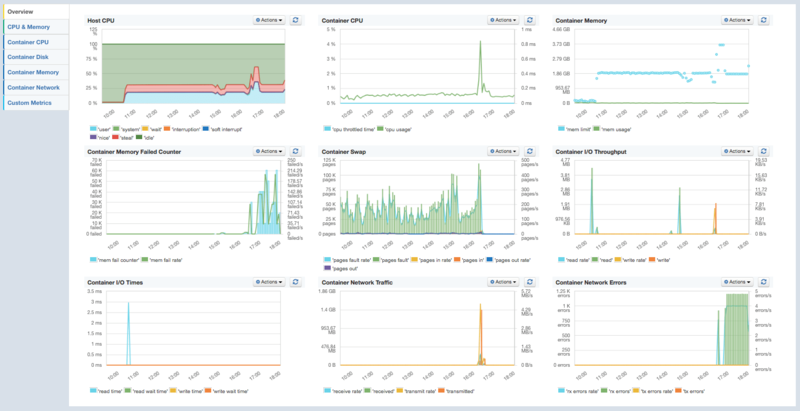 After about a minute you should see Metrics in SPM and Logs in Logsene. The CoreOS directory contains additional examples, such as a cloud-config file enabling SPM and Logsene service for logging journalctl output to Logsene ELK Stack. 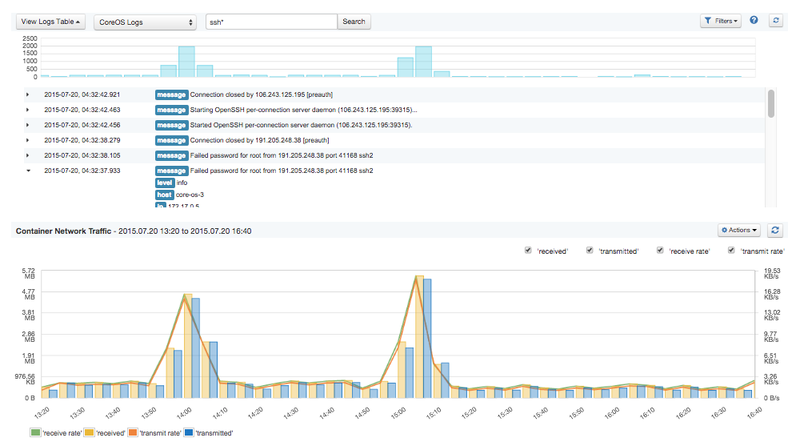 Having this setup allows you to take the full advantage of SPM and Logsene by defining intelligent alerts for metrics and logs (delivered via channels like e-mail, PagerDuty, Slack, HipChat or any WebHook), as well as making correlations between performance metrics, events, logs, and alerts. Running CoreOS? Need any help getting CoreOS metrics and/or logs into SPM & Logsene? Let us know! Oh, and if you’re a small startup — ping @sematext — you can get a good discount on both SPM and Logsene!